Quote Reply Topic: Sailing in tide..quiz. 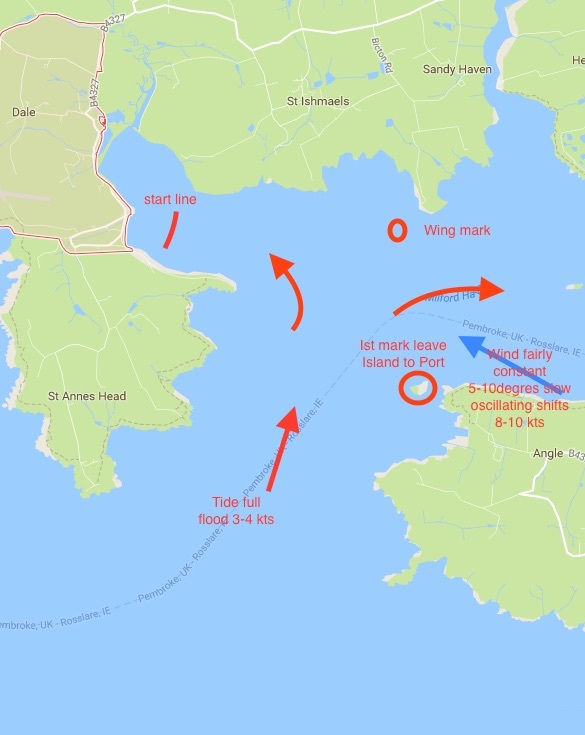 OK here's my first case study, taken from the Gate start thread, this was a race in the late 90's, long distance across the milford haven entrance channel off Dale, where all week the racing had taken place just off Dale in the confines of the bay and the cliffs of Queen Annes head had been offering favorable shifts to the right all week. So my question what's your strategy for the race it's a straight windward course round the island then a wing mark (boat) and finish at the start line beach. The wind is pretty clean maybe 5 degree oscillating certainly no more than 10, the tide is flooding indeed they had tried but failed to get the start off before it fully flooded. The line is pretty square but slightly favoured favoured the committee boat (starboard) end as the wind swung slightly that way during the 10 -5 countdown. Ha haaa... They've all had a squeaky bum moment Graeme. I thought the knowledgeable forumites would have sorted this out in a trice. It would seem not. I learned to sail on a river. Suspect others cannot be bothered feeding the troll. Three hours and not a peep, lol, it's one thing regurgitating something you've read in a text book, quite something else when someone calls you on it..
Head right off the line to pick up slacker tide or even back eddy off the headland and short tack up there until the channel. Then keep heading to the right and into the tide and try to cross the tide to the other side and come in to the with tide under me rather than coming from left and getting past the island in the lee of the shore. Reaches should be simpler with just crabbing enough to keep the track. Sorry, don't really read technique. One thing I don't get, in the same sentence you say the tide is flooding in and they tried and failed to get the race off before it fully flooded. By 'fully flooded' do you mean 'high tide', or is 'fully flooded' max current? I guess the latter? Also, no depth chart, so I'll assume there's no funky bathymetry or banks? I'd start middle line. Against the tide (does it run that far down?) there will likely be sag, and if you are expecting the wind to go back left you don't want to be on the right of fleet. The shift is right phase so you'd want to sail starboard first if you are expecting it to go back left. I'd also go left up the beat to get in to the shore away from tide which is pretty much with the wind. There may also be a left shift with convergent wind on the left shore to add to the oscillation left you are expecting. Coming in to the windward mark you'd experience a tidal lift in apparent wind too. You'd have to be careful not to over stand the windward mark though. You'd want to get a good transit on the reach and crab down as the traditional fleet windward arc will be even more pronounced with the tide pushing people high. Not much to do on the bottom reach unless there is a tide line where the tide splits which you'd want to get the correct side of. Ultimately, only you were there, so you could say anything worked, and we'd have no recourse. Pretty much exactly what the coach suggested, he drew it on a board, had he not done so I might not have even bothered, but it was too good an opportunity for an I told you so moment. The temptation for the cliffs, and yes maybe a back eddy swirl around St Annes head had almost the entire fleet doing as you describe, but the other route, bang over to the left where there was also a bit of a lift off the land, sufficient to get the nose into the tide and give a fair run out into the bay where the full blast of it not only lifted the nose but put the board on the plane, turned the the 8 - 10 knots into 10 to 12 knots which is marginal planing for a race board which reached the island whilst the fleet were still tacking up the coast in slacker air (which also lifts up and over those cliffs. But fundamentally it was tide initially on the nose then full on the lee bow which did it. So much so, that by the island the board had to be sailed free onto a reach. No Graeme just busy working....but looking forward to hearing exactly how you think you won it. So my strategy would have 3 parts. 1. Take the 'free' southerly uptide gain behind the promontory immediately to the south of the start line. I would want to be careful of any potential race on the headland. I'd reckon that right would probably pay, depending on the exact shape of the land and the feel of the breeze. Hopefully I'd have some shifts to help me get there efficiently. 2. I think I'd then sail a short starboard leg until I reached the port layline. This would come quite early because of the east going tide in the east side of the bay. I'd be worried about what sort of tidal compression I'd experience around the island - if it's strong then I would have made the wrong call. 3. For the rest of the race I'd make ground up tide when in less tidal flow, for example in the tidal lee of the island. That is to say I'd emerge as far west as I could without overly compromising my speed. If I thought there was going to be a significant increase in north going tide (a race) to the immediate west of the island then I would execute a different strategy. I would sail a long port tack first and flick on to starboard when I got to the layline for the mark, or, depending exactly on my tacking angle, before that, in order to take advantage of the maximum flow in the main channel before being tidally sheltered behind the southernmost headlands. But I'd still look to flick back on starboard and approach from uptide - remembering that this is predicated on a strong race off the island. Sorry - I don't understand what you mean. If you're sailing out into the tide you are also going backwards with the tide relative to the wind so the 8-10knts you talk about would be 3-4knts slower (or whatever the tide was). If you're moving backwards relative to the wind I also can't see how the board got more air under the nose to help it lift either. 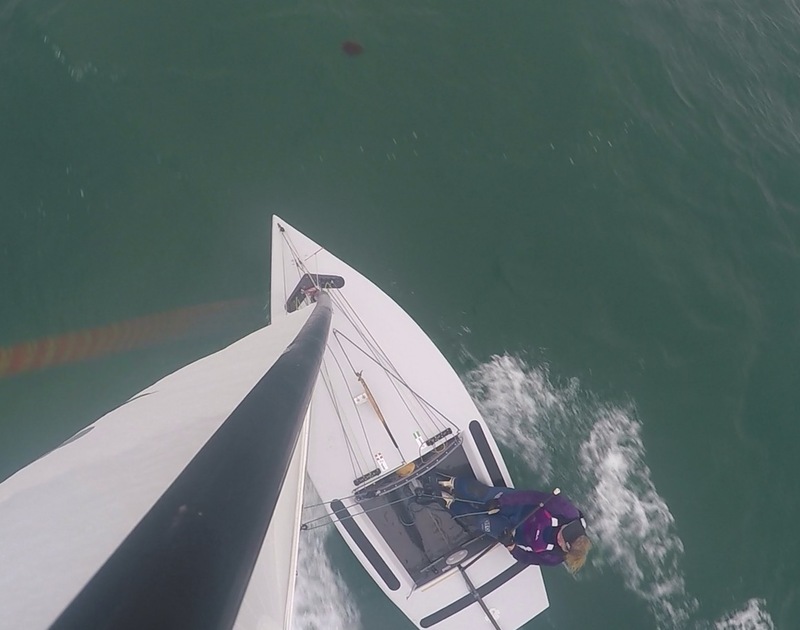 I spent many years on boards and have not long bought a big ol' raceboard again, so sailing a board v a dinghy is not completely alien to me. I don't see that there is a uptide gain south of the line, the way iGRF has shown it, the tide just runs straight into that arm of the harbour. Even still, you'd have to sail a header off the line on port to get there. When you do get there it will be a headed shore (divergent breeze) anyway. If there was a strong eddy you may gain, but all that effort to get over that way would be swept away when you hit the tide coming in northerly and north easterly. That tide would also give you another apparent header. 2. I think I'd then sail a short starboard leg until I reached the port layline. Coming up to the port layline late would feel pretty awful. Yes, the tide would be on your transom, but it would also be giving you a header. This would come quite early because of the east going tide in the east side of the bay.